The strange marketing materials for Quentin Tarantino's '9th Film' (as the poster says) feature (across two one sheets) the trio of lead characters leaning against 'the frame' of the poster. It is also present in one of the initial pieces of key art for Warners' Shazam! but I was too caught up in the similarities to Fox's Deadpool poster campaigns and the fourth-wall break, to note the innovation. Both are done by design studio, WorksADV. That being said, it is the only interesting thing about these heavily photoshopped posters. (When did Brad Pitt start resembling Scott Bakula?) Vague, touristy images, a couple of simple (dare I say, hasty?) location/period layers (a vintage car, the Hollywood sign, a cinema) to show the movie-stars present in nostalgia-chic. If this were indeed 1969, it would feel like they are in a Sears studio with a vinyl back-drop screen pulled down behind them. The artifice runs high. 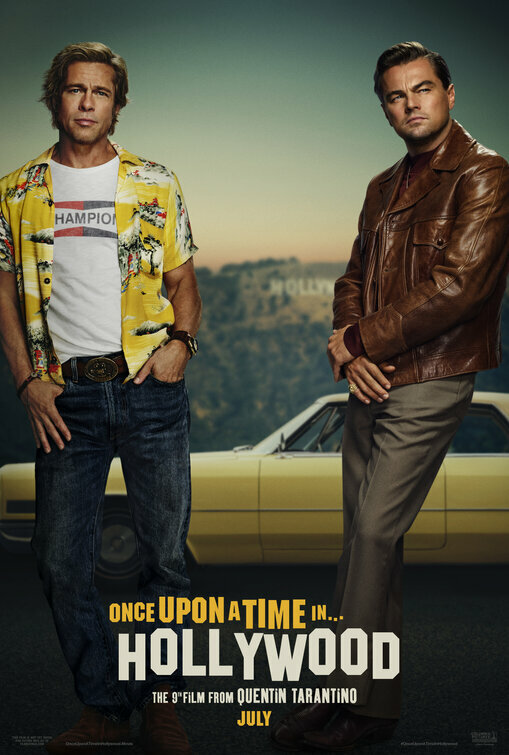 Perhaps that is the intent, I mean, the film is called Once Upon A Time...In Hollywood. Hindsight may afford some benefit to these designs to be a subtle insight to the filmmaking. Or perhaps the designer wanted to further explore having actors reclining in space in the studio. Were the actors standing in space, and the poster designed around the fake lean? This may be possible in Pitt's case, but unlikely in Di Caprio and Robbie's stance, who do appear to be leaning against something that was cropped out. For teaser posters --note the lack of credit block and emphasis on release date in the text-- the marketing should 'pull us in' and make us want to see the film. However, these are so artificially remote. Posturing has been a significant mode of Quentin Tarantino's appeal, but ennui has never been an attribute I would associate with this filmmaker. The trailer for the film strikes a far different tone.